This quirky apple bird feeder from Ruddick Garden Gifts has been designed by Sophie Conran. 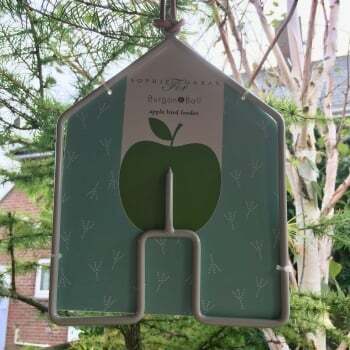 The house shaped apple feeder is cream in colour and made from powder coated galvanised steel and comes complete with a 15cm leather hanging cord. Simply place some fruit on the spike and suspend from a tree. Ideal for apples, plums, halved oranges, pears or any soft fruit all of which make a safe, healthy and delicious addition to a wild birds diet.